and found these two proud specimens. Very similar in size and shape. The neat thing I like about these plants versus the store bought Callas, are the leaves. I love to paint all the leaves with their curvy lines as they make the perfect compliment to the simple, pure elegance of the Calla. I was visiting a friend who works in pastel and she pursuaded me to try her pastels. I find them messy to use but enjoyed the companionable time together. I liked hers a lot better than mine! These smaller calla lilies are the type you buy from the grocery store as a plant. They come in a variety of colors and this particular one has rich, yellow streaking though the red. I wanted this painting to be rather colorful, playing off the yellow and red in the callas with a yellow vase and an accent of blue by adding the pansy. A dark background sets off the white flower beautifully but I found it had no spark... so after doing my series of red it was a natural to try a bit of red behind the Callas. Using a different approach helps me determine my personal response to the outcome of these small paintings. I find it interesting how I can enjoy the actual act of painting all of them but only be satisfied with parts of the finished products. Labels: . still life. calla lilies, red. Trying a different approach and out of my comfort zone. I went for simple shapes and not too much detail other than in the Callas. The master of simple shapes was of course, Georgia O'Keeffe. It was the rhythmic shading within those simple shapes where the real beauty and skill took place. 6x6in oil on canvas 80. A friend arrived bearing the gift of calla lilies. It has been a while since I painted them so it was an enthusiastic session in the studio. I will do a few paintings while they are fresh. They will be opening up a lot more and make very interesting shapes and grow a deeper cream color. .
6x6 oil on canvas 75. I really enjoyed painting this sweet little jug partly because the shape is so neat. As I was working on it I saw several different shades of blue in the glaze which were not apparent to me before. A little bit of lavender, some cerulean, working gradually into a cobalt. All very subtle variations The potter who made it must have come up with his own recipe. Labels: blue jug. still life. colors. potter. This is a fast cloud study. I say fast because as soon as I started it, it had already changed. In this case, after I had sketched in the position I then used the colors I saw even though the positions had changed. The large white cloud stayed pretty much the same because it was further away but the patterns of the overhead ones changed very quickly. I love New Mexico clouds at this time of year. 8x10 oil on canvas 150. I love the desert because the absence of grass allows the formation of the land to be clearly seen. Here, the sloping hillside shows how the rains create culverts which in turn provide wonderful shadow patterns. Natures colors are pretty amazing. The cool blues of the distant hills, ochres and reds of the earth, the cool, light turquoise of the rabbit grass, rich greens of the pinon bushes, topped off with the purples of the shadows. No wonder artists love it here. 8x6in oil on canvas $100. The annual Folk Art Market was on in Santa Fe while I was there. I am constantly amazed at the wonderful craftsmanship and intricate designs...truly first class works of art. But, to me, even the most simple objects can bring pleasure. I cannot help but smile when I look at these two cats. Not amazing works of art that is for sure, but someone whittles them into shape and then someone else paints the colours...and along comes another artist who makes a painting of them! I find the same comparison in painting. It isn't always the most professional, well done painting that I find appealing. There are beginning artists in the guild who can make my heart burst with delight when I look at what they have done. Sunset at the Bosque, NM. New Mexico unfortunately has some fires burning in several places and the sunsets have been outstanding because of the smoke. The Bosque del Apache Refuge is a wondrous place where tens of thousands of birds gather for the winter. It is between Las Cruces, where I live, and Albuquerque/Santa Fe. Artists come from all over the country to paint the area. Unfortunately, because of the extreme fire hazard, most of the Bosque was closed but I was able to find a new spot just in time to capture a fast sunset. The hollyhocks are blooming all over Santa Fe. They are so colorful and tall that they appear to be nature's perfect counterpoint to the earth colors and structures of the adobe walls and buildings. Yesterday I posted the painting I did of the hollyhocks before I did this study. There is a huge difference between painting something close up like this and the more distant landscape. Close-up observation makes for a more confident, and swifter brushstroke. I am gaining a lot of respect for the ability of the artists who specialize in painting miniatures. I can already tell this painting-a-day commitment is going to be a valuable experience for me and should help my painting skills in different ways. This is the time of year when the hollyhocks are blooming all over Santa Fe. They are beautiful and are painted by most 'realist' artists at sometime or other. It is hard to do anything this small but I decided to put the wall they were growing up against in the painting and later I did a study of only the flowers. Two completely different types of paintings. I will show you the other one tomorrow. I fell in love with this sink. It was a pleasure to look at and with it having the slight imperfections of an artists hand it helped me realize that everything does not have to be perfect. So this painting is offered in the same spirit. My trip is coming to an end and I have many images and color studies to take back from which to produce studio work. My artist friends have been a wonderful inspiration and help. I will miss them. After the Storm, Santa Fe. The heavy rain had me running for cover. After it had finished, the arroyo filled so full it looked like a regular stream. As I knew the water would sink into the ground pretty quickly, I took yesterday's painting and wiped out the adobe house and fence and painted the new view. The hills were actually behind the adobe from my painting yesterday, so I did not need to change the mountains. I used the palette knife for speed and working so fast, this small, does not allow for careful strokes. Even so, I still like the end result. This adobe was a brighter pink than shown but I could not replicate the same hue. The foothills are full of adobe colors peeping out between the pinons and chamisas. We went to Galisteo and Cerrillos, two small villages outside Santa Fe. Wonderful! The fences are made of sturdy branches and are called coyote fences. The clouds are starting to gather for the late afternoon storm. There is nothing as beautiful as the summer clouds of New Mexico.This area is known as Georgia O'Keeffe country and the blue, distant mountain is her beloved Pedernal. Lots of artists come here to paint and it is easy to see why with the amazing rusts and ochres everywhere. The greens of the pinon bushes become the accent color. Today was the first morning painting in the Santa Fe area. We drove to my favorite spot about an hour north of our casita... between Abiquiu and Ghost Ranch. 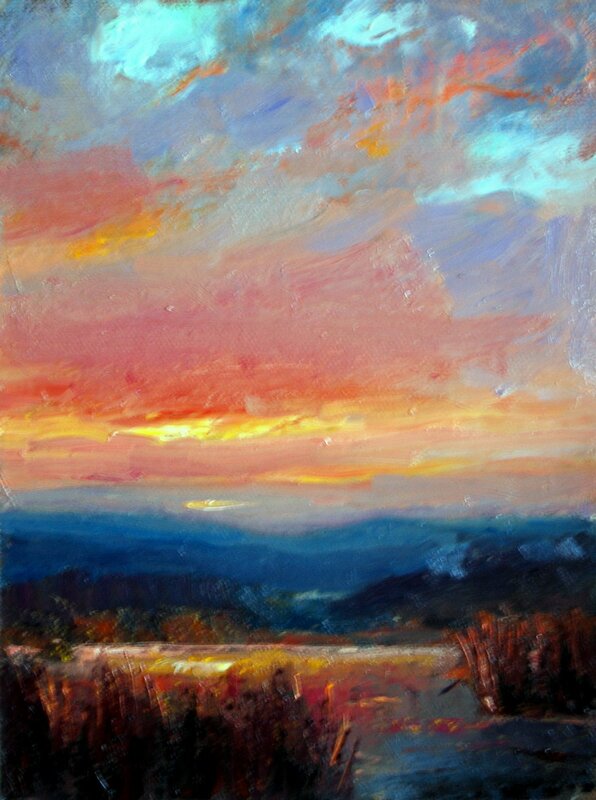 The light was changing so swiftly that I changed from my brush and worked with a palette knife. The amazing reds of the earth caught the morning light and appeared to be almost florescent. I had to knock the intensity down quite a bit. Anyone who has been here understands how vibrant the colors actually are. Tomorrow we are painting people. Should be fun. I am still doing the red studies and on this one I surrounded the jug with sheets of colored tissue paper. If this were a white jug then all the colors would have reflected back into it but this red, being a deep value, absorbed the paler colors. I did discover that the cool light from the window reflected a lavender color onto the plane facing it. This was a lot of fun and I enjoyed doing it. One more red study to do and then I am off to Santa Fe, NM. to paint with some friends for 5 days. I will be sure to keep up with my Painting-a-Day...it will be a good excuse to do some really small plein air pieces. 6X8 in oil on canvas 100. Another in the red series. I love this little metal, tea tin. The reds were easier this time. I used orange to lighten so it did not get chalky. I enjoyed painting the metal inside of the tin and then in contrast, the china cup. I asked my husband if it is called "a tin" over here and he said, "no...a container." coming home with a rintintin joke so I think maybe he could be wrong. I do not understand why after all these years I can still get mixed up over the spelling differences...colour etc, pronunciation...tomato etc, and items like this red tea tin. And I still call the car trunk, the boot! 6"x8" oil on canvas 100. A friend gave me this teapot and I love its brilliant color. examine the colors in the shadows and then work out how to achieve them. It kept me interested, then frustrated...then interested. 6"x8" 0il on canvas $100. The Farmer's Market here in Las Cruces has been named one of the top ten in the country. It also has crafts. I went with our guests and found these brilliant, red onions to go on the grill. The more I looked at them I found I wanted to paint them as red is always an interesting challenge. I really enjoyed doing this piece so I have decided to paint some more red things. I appears to be one of my favorite colors as I have collected quite a few still life items in red. I have painted this mustard jar quite a few times because I love the red, white and blue lid. Regarding my nest series....I am out of nests to paint in this small format (done them all) but am doing some larger ones and having a fabulous time. 8"X6" oil on canvas $100. A new plein air painters group has been formed here in Las Cruces and I was thrilled to join them on a trip to Three Rivers. Several talented artists participated and it was a lot of fun. We all worked hard and I did three small paintings - this one was my favorite. Labels: church at three Rivers, hree Rivers, NM. Plein Air Painters of Las Cruces. and when my amazing god-daughter and her mother arrived for the weekend they came bearing gifts, one of which were these beautiful, yellow freesias. Even more of a gift...they allowed me the time to paint them! Colors are "following the color wheel" from oranges into the yellows and then into the greens. A wee bit of purple added to calm things down a bit. 8"x6" oil on canvas board 100. This amazing home has been intricately woven with fine strands of threads torn from the yucca leaves. Inside it has plenty of feathers glued with spider webs, lining the bottom. It is very deep and I can see how protective it would be for the eggs. This one I found outside after a strong windstorm. I live in New Mexico and have seen nests like this in the cactus so that is why I named it Cactus Nest but if anyone has the actual birds name I would appreciate them letting me know. Labels: birds nest, cactus, yucca. Another completely different nest. I expect to most viewers they all look the same but as I carefully study them before I paint them I am struck by the differences in nest construction and the materials used. This beauty is narrower at the top, broad and low at the base with a lot of woven, soft materials like moss, lint and even bits of newspaper. The form of this one reminds me of my grandcat because she has a "skirt" hanging down underneath. My friend found it under some pine trees and mentioned that the oak leaf suprised her as there are no oak trees for miles around. Neither of us know what type of bird built this nest. 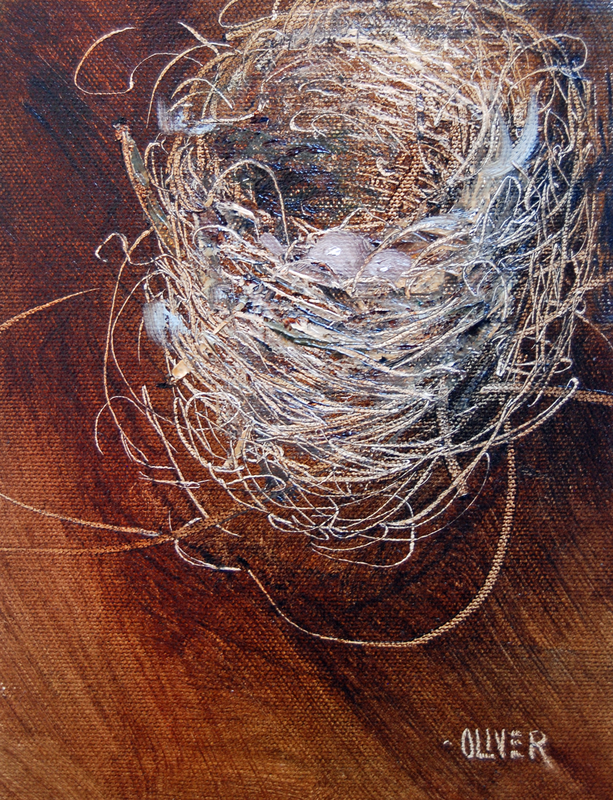 Flo Hosa Dougherty is a wonderful artist and she loaned me this nest. Thank you, Flo.